NextGuitar Heroes: Bryan Adams ‘Run To You’. Interview: Whitney Tai and her dream pop world. Dream Pop sensation Whitney Tai has shared her music, some of her story and ideas in conversation with music enthusiasts and industry insiders over the years with sincerity and integrity that it’s hard to imagine she has anything left to say. Then late last year, alongside co-writer Michael Trainor, she released Flowers By The Roadside, a song with glinting soundscapes and haunting vocals, that is as honest and relevant as anything current on our charts. What makes it all the more appealing is its emotional punch, something that Whitney is no stranger to. Often Whitney is known to dig deep in her emotional well to find inspiration, channelling her feelings into her songs and performances. Whether she is crossing genres between pop and indie or blurring the lines with her unique blend of dream pop, Whitney is completely in total control of her own musical odyssey. With that in mind I recently had the pleasure of catching up with the former New Yorker, who is incidentally nowadays based in the bustling musically mecca of Los Angeles. Here is some of what we talked about. Dream Pop is often a difficult term to define. How would you describe it and what are the qualities that you bring to music that might be different to say indie Pop? For me, it has always drawn from alternative rock with lush sonic textures, dreamy atmospheric vocals and a retro underground feel. Since I have a severe case of synesthesia, I am drawn to creating sounds that maximize the senses. Dream Pop and Indie Pop are kinda like cousins but Dream Pop can feel 80s esque, texture / melody driven and create a really fat wall of sound. Indie pop gives me this rebellious post punk feel or 60s pop music revival. However, they are closely related and blur the lines pretty often. Did you intentionally set out to channel dream pop? Coincidentally, our dream pop sound just seems to be the result of my particular approach to music and the combination of my producers influences/approach. Tim and I are big film score addicts, we love creating tasty landscapes of sound. I am melodically driven when I compose and find myself happiest making stuff that has a certain ambiance, healthy mix of avante garde tones and meditative patterning. The magic is making you wanna knock your head back and forth but also instilling calm or trust in the moment. The late great David Bowie was a chameleon when it came to music and being able to switch between genres at will. I’ve noticed you can effortlessly drift between pop and indie and even electro pop. From the driving rock elements of Forever to the synth beats of Truth Be Told what drives you to change it up? I just live for creating art. Those genres often have a seamless connection due to the nature of their sound and production. Sometimes I can’t help but remember I’m a creature of a vast universe where absolutely ANYTHING is possible. I hope to offer and share myriad experiences in unnumbered ways and especially not deny all the incredible humans on this earth from enjoying a message/sound/lyric that speaks to them. Is there an artist and or an album that was an inspiration behind how you approached music? There are 3 albums that really lit my fire as a kid. The first was “Dark Side of The Moon” by Pink Floyd. I remember being fascinated by how confidently cool and relaxed the music was, how chill and yet edgy with sound effects that make you say holy awesome. Sounds from a far off planet and amazing moody attitude for days. The 2nd two albums were “Rubber Soul” and “Sgt. Peppers Lonely Hearts Club Band” by the Beatles. Both of those albums made my psychedelia antennas spring up. The songwriting is brilliant, the song structures feel sublime and just flat out have this pulsing drive that made me want to become an orator or climb a damn mountain. The point is: these albums rocked and I felt very connected to these bodies of work in their refined sense of form, composition, experimentalism and storytelling. You have an amazing soulful voice. Did you study or train as a vocalist? I didn’t train for voice. It was always there but being the perfectionist I am, I wanted to hone that stone till I reached extreme confidence in my vocal ability. I used to practice a lot of different style songs and wrote a lot as a child. I took voice and piano throughout my career to constantly work the muscle and challenge my diaphragm so I could really belt out notes and soar with them. I had this really amazing coach at one point back in New York and her name was Jacqueline Jordan. Jacqueline was a truly gifted opera singer of Julliard School who really opened up my mind and vocal tenacity at a time when I needed to be a butterfly. What is the biggest difference between New York’s music scene and Los Angeles? Was the change of scenery an important part of your musical evolution? I love the bustling music community of Los Angeles. LA is strong with supportive artists and dedicated music lovers who really care about the art and pushing boundaries with this insane fearlessness. I have been humbled and inspired by the scene here. When I had my starts in music, NYC offered me a really cool echelon of underground exclusive vibes. I love the gritty posh glam of NYC and how it’s streets become yours even though it belongs to millions of others. There is a magic in that when making your most vulnerable art. As a songwriter would you agree the whole idea of songwriting is to try and capture a feeling? I think everyone will have their own individual response to that. In my process, music is definitely about capturing feeling and creating a beautiful geometry. I want to build with colors, shapes, volumes, textures and emotions. What could be more beautiful than to channel or capture something universally felt by your peers rooted in artistic expression and independence? As a songwriter, I can’t imagine anything more beautiful than this. Music in essence is a tool you have used in helping you heal from adversity and tragedy early in your life especially around the time when you lost your mum to cancer. Tell me how you channelled your pain into music? What was that process like and is it any better today? I think it’s a process I am still learning. Loss is one of those things that stays with you for a long while, maybe even a lifetime. Being so young at the time, I didn’t have the tools or “know-how” to process grief. I felt very alone and broken but oddly I knew she would never accept me laying my head down and giving up. She was a fighter. So I decided I must be one too. My pain became my armor… as if it melted into my skin and bones. I attribute her loss to my strength. She allowed me to appreciate the world through new eyes and never take anything for granted. When I lost my grandfather a few years back (my mother’s father) I felt completely ripped wide open again. He was my best friend and last living connection to my mother. It was only a matter of time before my art would carry them within it… and it does to this day. Your bio says that sense of loss and longing you experienced eventually found its way onto your debut single To Be Loved. Do you think fans and music enthusiasts who love that song have in some way adapted that song (and others like it) to their own lives and made their own sense of it? Omg, totally! I remember when I first released that song how much others personalized it and really took ownership. It was so insane since it was my first breakout single to experience everyone’s response (especially when this song was my own way of dealing and verbalizing the pain so that I could make sense of it all). I think my fans may have understood more of what that song meant to them at the time than what it meant to me. My work tends to be a conduit and sometimes it takes you a little while to reach the end of the pipe and look back to see what the hell you just crawled out of. This was an anthem I needed to unearth, a piece of my inner child speaking out for love. One of my favourite tracks is How Was I Supposed to Know. It is truly beautiful piano-driven song set against your haunting vocals and the song’s moody string sections. How do you even begin to tackle a song like that? Can you tell me something surprising about it? Thank you so much. At that time, I was getting over the ultimate heartbreak and my trust was pushed so far over the edge that I needed to finally strip back and bare all. Writing this felt like walking out on stage for the first time… or having a dream that you are somehow magically naked in front of a bunch of strangers. It felt like a violation but at the same time you are like, ok… how do I actually deal with this? “How Was I Supposed to Know” began with just me and my guitar one afternoon when I was living for a short while in New Jersey. I used to open my blinds really early in the morning to let the sunlight in where my puppy would sleep and the sun would cast a series of beautiful lines across the space. In those warm sunrises, I would sit at my desk, write melodies and just feel the day. Accidentally, after a long Skype call with my producer, Tim heard me crooning this in the background and instantly fell in love with the track. His vision to produce the song with a piano and string arrangement instantly made sense. Thanks Skype! Endorse our next album!! haha. Those were the humble beginnings of HWISTK. Whitney, you are definitely not a person who is afraid of speaking out about things that matter to you. An increasing number of amazing female artists are also speaking out and taking charge of their careers. Interestingly, taking ownership of your own music is something that you have done for years. What else in terms of advice would you give the next generation of performers? We are here for a limited amount of time and that time should be spent doing what makes us happy and grow our roots. Struggles will always come along with life but staying authentic to who you are and what you believe in amidst that is a real superpower. My humble advice to anyone pursuing a life of performing or artistic creation is to believe in yourself. Believe in yourself when they scold you, when they hold you back, when it’s extremely hard, when they doubt you… because at the end of the day, you have to report to the YOU inside. Stay hungry, keep growing, push your limits and don’t be afraid to fall. You can get back up and come back 10x stronger. These are rights no one can take away. Let yourself be a viking with all your battle wounds. I cannot let you go without touching on your new single Flowers By The Roadside. It pretty much captures what we are feeling right now. Is that a fair assessment? Flowers is definitely a testament to the moment. The song is about being present enough to know the value of your freedom and rights. It’s about being present enough to actually live inside that reality. In a hot political and socio-economic climate where our future appears very uncertain, certainty of ourselves, differing belief platforms and personal validity are so welcomed. We don’t need more separation, these moments are best spent brainstorming how to become closer to minimize the gaps. Writing this song with Michael Trainor felt very healing. It addresses fixing world issues –not getting tangled in what divides us amongst these issues. 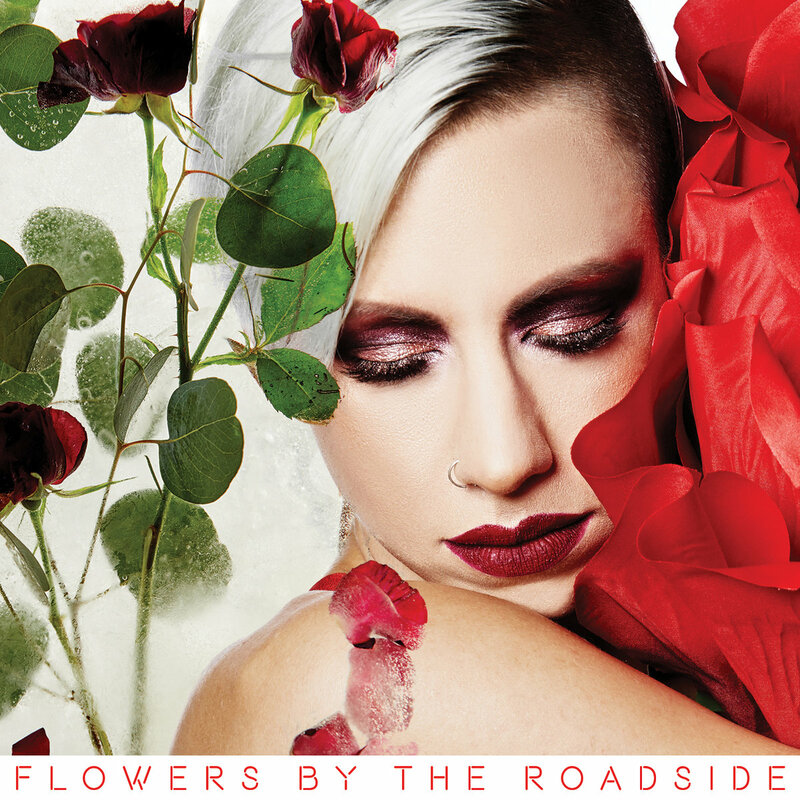 Whitney Tai’s latest release Flowers By The Roadside, including her back catalogue, is available to purchase on Bandcamp | cdbaby | iTunes. For more information on Whitney Tai, including upcoming shows, check out her website. Also listen to Whitney Tai via streaming services on Soundcloud | Spotify | Apple Music. Follow her on Facebook | Twitter | Instagram. Watch her on You Tube. Photo credits: All images used are courtesy of Whitney Tai.